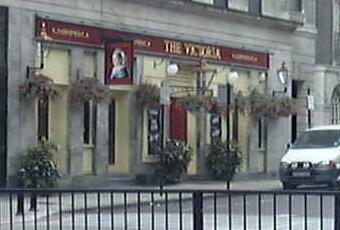 This pub is right next to one entrance to Victoria station. But it's not one I've ever noticed before. It's a Greene King pub and it had their IPA & Abbot. Guests were Wimbledon Copper Leaf & XXK & Welton's Wenceslegless. I went for the XXK, which was £2.50 for just under a half (short measure). Marginally better than the nearby St George's Tavern, in that it was a little more comfortable inside. But still very average. I was told about this pub by an old lady friend in Oz who had visited here for a meal while on a coach tour. She described it as a quintessential English pub. I don't think she saw many. It is a perfectly good pub, with a pint of Doom Bar @ 3.85 being a good 50 pence cheaper than some nearby. Very nice sausage & mash, friendly & efficient bar people; its probably no accident the coach driver chose this pub for his Oz pensioners. Nothing out of the ordinary, resembling some of the other pubs around here e.g. the St. George, but quite comfortable and civilised, on the Saturday night that I was there anyway. Half decent pub near to Victoria station. A bit too Weatherspoons for me but you are still near central London and bigger pubs tend to get like this. A couple of real ales on the bar and co-operative, helpful bar staff.